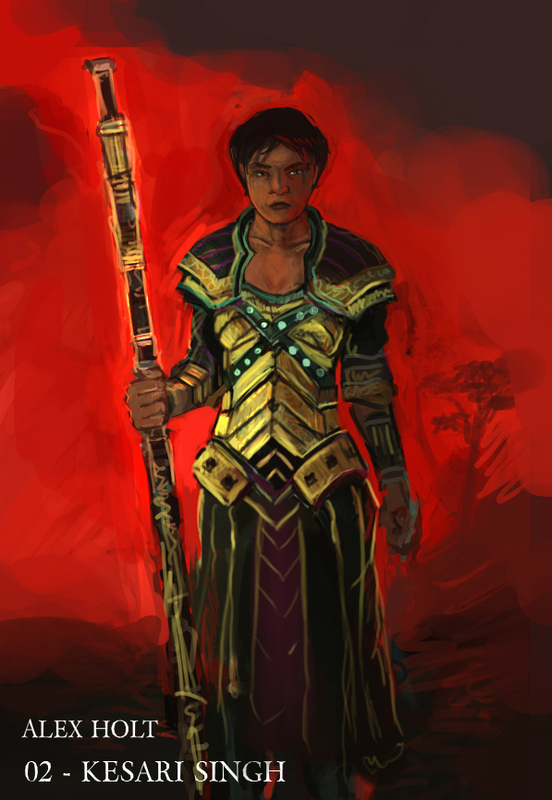 Kesari Singh is the latest bearer of the ancient weapon known as the Divine Rod. It is an incredibly potent artifact, created over 1200 years ago by some of the holiest men in the world, distilling a tiny portion of the essence of their Gods into a staff. It’s powers are vast – it grants the bearer superhuman reflexes, and automatically guides the movement of the bearer to the point where a weilder could stroll forward into machine gun fire and the staff would deflect every single bullet. It is also capable of prolonging a bearers life indefinitly, breaking any substance short of something similarly divinely infused, absorbing energy (divine, magical and natural) and banishing monsters and demons from this realm. It does have one rather specific requirement though – it cannot be used to kill nor be used by a killer – in the hands of such a person it is merely an ordinary staff. While this doesn’t include accidents, it is specific enough to include that a bearer must have never knowingly consumed meat. This tends to be the way through which the staff is passed on – eventually a bearer tends to encounter an evil which no other can defeat, and can only be ended with it’s death, and so they unleash its awesome power once to end this evil, but in doign so become unworthy of the staff. Kesari is the current bearer of the staff, having bourn it for twenty seven years now – she was raised from birth to be worthy of it. Now she walks the land vanquishing evil and protecting the innocent wherever she goes. This was an attempt to use a challenging colour palette for a painting and I don’t think it necessarily entirely worked. That’s not necessarily a bad thing though, as you can’t really improve without pushing your boundries. Slightly more irritatingly, focusing on the colours caused me to mess up on the anatomy a bit, but nevermind.